1) There are both narrow and broad notions of Central Asia. The narrow one relates to the 5 Central Asian republics of Uzbekistan, Tajikistan, Kazakhstan, Kyrgyzstan and Turkmenistan, which until 1991 were part of the Soviet Union. The broader notion, however, also includes the southern Caucasus, northeastern Iran, northern Afghanistan, western China, Tibet and Mongolia. In the last 3 decades the narrow definition has become increasingly dominant, its origins going back to the 1920-30s when the Bolsheviks created 5 new ethno-territorial polities on the territory of the former Russian Turkestan and adjacent eastern territories of the Russian empire. Prior to the Russian conquest in the late 19th century the region did not possess well defined political borders. Throughout history the political, cultural and religious centre of the region was situated in the Ferghana valley which, in Arab sources, was referred to as Mawarannahr (What is Beyond the River, i.e. Amu Darya). 2) When, in the 7th century AD, Arabs brought Islam, the region was politically and economically shaped by eastern Persian-speaking Sogdians who played a central role in the lucrative trans-continental trade Silk Road. The Sogdian cultural input formed the cornerstone of Central Asian identity, which persisted long after the demise of Sogdiana in the 8th century. Under the Sogdians’ successors, the western Persian-speaking Samanids, who dominated the region in the 9th and 10th centuries, the Ferghana valley’s cities of Bukhara and Samarqand became world centres for science, art, philosophy and Islamic scholarship. They produced great thinkers of the Middle Ages, including Rudaki, Al-Farabi, Ferdowsi, Al-Biruni and Ibn Sina, as well as al-Bukhari, the author of one of the most authoritative hadith collections, and al-Maturidi, the founder of al-Maturidi Islamic scholastic theology (kalam). Later on, al-Maturidiyyya provided the doctrinal framework for the flexible, adaptable and syncretic Hanafism-based Central Asian Islam. 3) Another formative influence on present-day Central Asians was the succession of militarily superior Turkic- and Mongolic-speaking nomads who dominated the region as well as wider Eurasia, including Rus, between the 10th and 16th centuries. 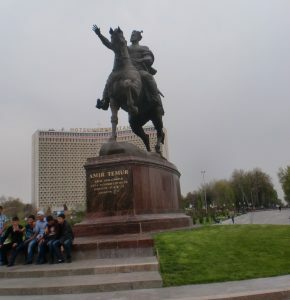 Of special significance was the lengthy existence of Central Asia and Rus (as well as other parts of the Eurasian continent) within the Genghizid Islamised space. Its legacy accounts for the notable similarities in their political, military, economic, juridical and fiscal organisation, their court and diplomatic ceremonies, as well as their culture and belief system despite Rus’s official affiliation to Orthodox Christianity from the 10th century. In the religious sphere the Genghizid/Timurid period was responsible for the ‘making’ of a distinctive Central Asian Islam centred on oral, rather than book-based Islam infused with Sufism, shamanism and the Persian musical and poetic heritage. 4) In the late 19th century Central Asia was incorporated within the Russian Empire which, early in the 20th century, was superseded by the USSR. Arguably, this incorporation was made easier by the structural and ideational commonalities between Russia and Central Asia. Significantly, following the Russian conquest, many Central Asian ulama continued to regard the region as the Abode of Islam (Dar al-Islam). At the same time, the Russian conquest further deepened the distinctive nature of Central Asian Islam by politically separating the various Muslim peoples of Central Asia from their ethnic and religious brethren in Xinjiang, Iran and Turkey. 5) Soviet rule had a transformative impact on Central Asians for 4 major reasons. First, it created ethno-national and territorial divisions into the previously loosely defined region and established the primordially understood Uzbek, Tajik, Kazakh, Kyrgyz and Turkmen nations. Second, it introduced Central Asians to comprehensive Sovietised modernization, which put them much ahead of their co-ethnic brethren and co-religionists abroad, as well as generating new affinities with other Soviet peoples, of both Islamic and non-Islamic heritage. Third, it drastically reduced the societal and political role of Islam by forging a Soviet Islam represented by the pro-government muftiate while pushing other practices of Islam underground. Finally, and most importantly, the Soviet system, which drew on the Eurasian political and social model, was appropriated and internalised by the Central Asian national elites and populace. 6) For these reasons the Central Asian elites and people reacted particularly negatively to the weakening and subsequent disintegration of the Soviet Union, remaining the most ardent supporters of its preservation. Having been excluded from decision-making regarding the future of the USSR by the leaders of Russia, Ukraine and Belarus, the leaders of the 5 ex-Soviet Central Asian republics were left with the existential challenge of creating nation-states within the Bolshevik-imposed borders which cut across homogeneous ethno-cultural communities. In doing so, most Central Asian elites, with the initial exception of Kyrgyzstan, mobilised the Soviet model whilst promoting ethno-nationalism instead of the discarded communist ideology. 7) The break-up of the USSR and the reintegration of newly independent Central Asian republics into the world ummah have been conducive to the so-called Islamic revival, which has challenged both Central Asian Islam based on al-Maturidiyya-defined traditionalism and pro-government Soviet Islam. 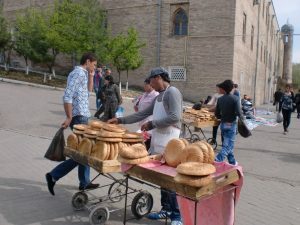 Moreover, in the 1990s Islam entered politics and provided an ideological platform for the opposition in Tajikistan and Uzbekistan. Since the 2000s all the Central Asian republics have effectively returned to the Soviet model of state-Muslim relations though the model itself has been increasingly challenged by globalised Islamic influences, including those of an Islamist and jihadist nature, which may strongly affect the younger generation in particular through their presence online and on social media. 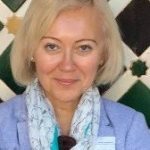 Galina M.Yemelianova has researched and taught for over 30 years on various aspects of Middle Eastern and Eurasian history and contemporary Muslim politics. Among her books are Yemen under the Ottoman Rule: 1538-1635 (1988), Russia and Islam: A Historical Survey (2002), Islam in post-Soviet Russia (2003) and Radical Islam in the former Soviet Union (2010) and Muslims of Central Asia: An Introduction (2019). 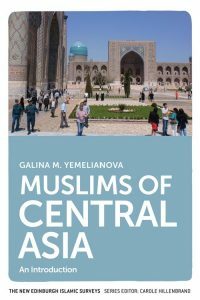 Muslims of Central Asia: An Introduction by Galina M. Yemelianova is publishing in January 2019. Find out more on the Edinburgh University Press website.